Cherai Beach Resorts is a unique health resort of excellence perceived and promoted by a group of enthusiastic doctors in the upcoming tourist destination Cherai beach, the “Princess of the Arabian Sea”. It is the ideal location in virgin vypin (vypeen) island built for the delightful comfort and holistic well being of the health conscious nature lover. 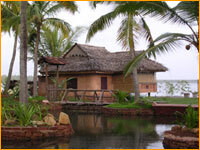 Beach and back water is the main attraction of this eco friendly resort. The resort is exquisitely landscaped with lagoons and canals meandering in and around a number of cottages (heritage & modern) built around picturesque greenery overlooking the clean long beach at the front and serene backwaters behind. Here you can see the harmonious co-existence of man and nature.Within two years of inception this property is rated as one of the best among the best get away destinations of Kerala and thanks to it Cherai Beach is now one of the tourist hotspots of Kerala. Eco-friendly Garden Villas, Conference Halls, Open Air Restaurants, Tree Houses, Fishing facilities etc added to the ambiance of the land will refresh and rejuvenate you. Air - Nearest airport – Cochin International airport (NEDUMBASSERY - 23Kms). Rail - Nearest railway station is at Aluva 23 Km.away from cherai. Kochi hasTwo stations, Ernakulam Junction and Ernakulam Town. Trains from the Northern cities / Southern parts of India stop at Ernakulam Junction. Ernakulam, about 26 km away from cherai. Road – The new Goshree Bridge from Ernakulam that stretches out across the backwaters connecting the islands of Bolghatty, Mulavukadu, Vallarpadam and Vypeen make tourist access to this beach much more easier which is 22km away (45 minutes by bus) or taking the longer road route via Edappally to North Paravur and from there to Cherai, a distance of about 25km. >> Doctor on call available at any time. 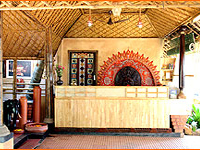 Ayurveda wing consists of a team of experienced Ayurvedic doctors, Medical assistants, masseures and dietitians with decades of experience in Patient care.“AYURMANA SPA”, the treatment center in a unique natural ambience is very much appreciated by the guests. We have facilities for all types of Ayurvedic treatment, Yoga and Naturopathy. • Check out: 11 am & Check in: 12 Noon. • All Rates are in Indian Rupees. • Tariff includes Complimentary Buffet Breakfast.